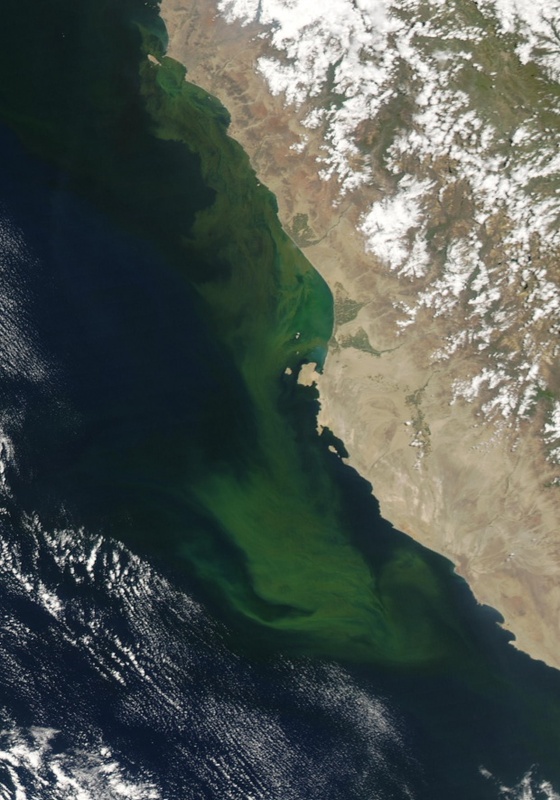 A vast area of the Pacific Ocean along the coast of Peru is colored green with algae in this image, acquired by the Moderate Resolution Imaging Spectroradiometer ( MODIS ) on NASAs Aqua satellite on February 23, 2004. Like their land based counterparts, algae are green because of chlorophyll, the pigment that translates solar energy into nutrients for the plant. The algae are growing near the surface of the ocean where sunlight can reach them, and near the shore, where cold ocean waters are pushed from the bottom to the surface. Such waters carry the additional nutrients the algae need to grow. 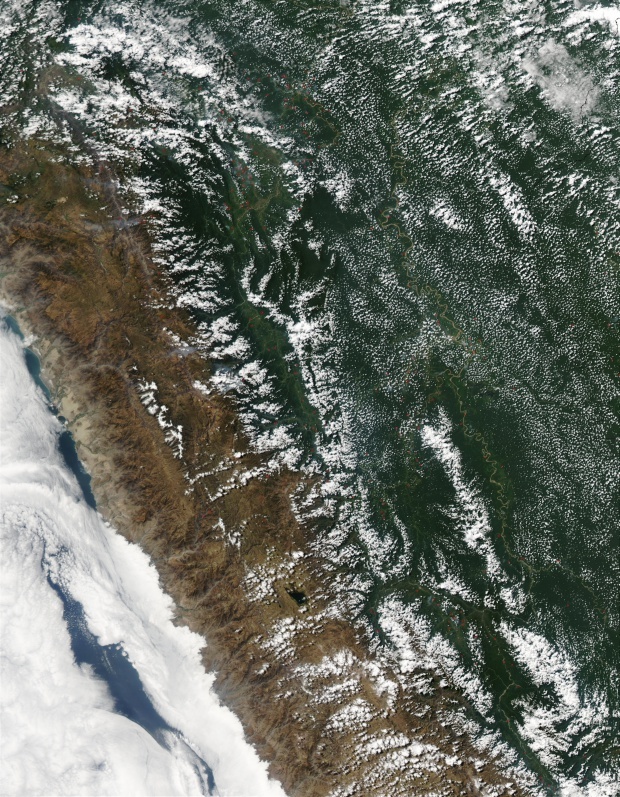 In the Andes Mountains in western Peru, the Moderate Resolution Imaging Spectroradiometer (MODIS) on the Aqua satellite detected numerous fires burning on August 14, 2003. In the image, the fires have been marked with red dots. This Advanced Spaceborne Thermal Emission and Reflection Radiometer (ASTER) image, cropped from a full scene, covers an area of 14 x 18 km. 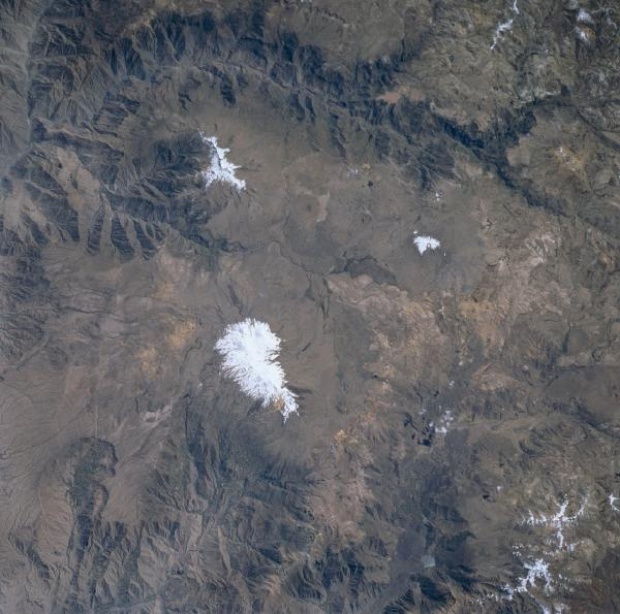 ASTER, an instrument aboard NASA’s Terra satellite, acquired the image on December 22, 2000. Visible and infrared spectral bands were combined to create a simulated true-color image. 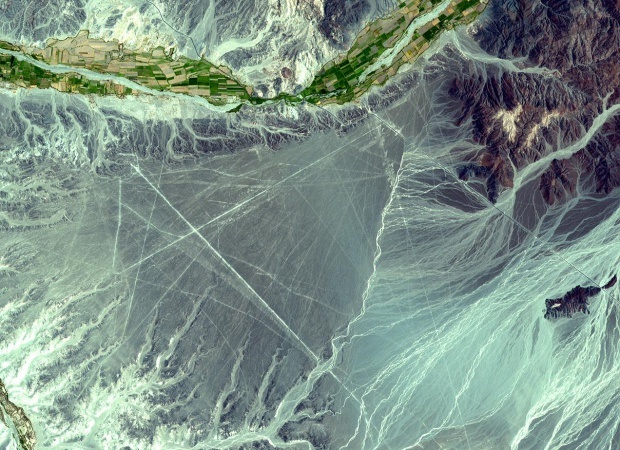 The Nasca Lines are located in the Pampa region of Peru, the desolate plain of the Peruvian coast 400 km south of Lima. The Lines were first spotted when commercial airlines began flying across the Peruvian desert in the 1920’s. Passengers reported seeing ‘primitive landing strips’ on the ground below. The Lines were made by removing the iron-oxide coated pebbles which cover the surface of the desert. When the gravel is removed, they contrast with the light color underneath. In this way the lines were drawn as furrows of a lighter color. On the Pampa, south of the Nasca Lines, archaeologists have now uncovered the lost city of the line-builders, Cahuachi. It was built nearly 2,000 years ago and mysteriously abandoned 500 years later. Lake Junin, Andes Mountains, Peru June 1993. 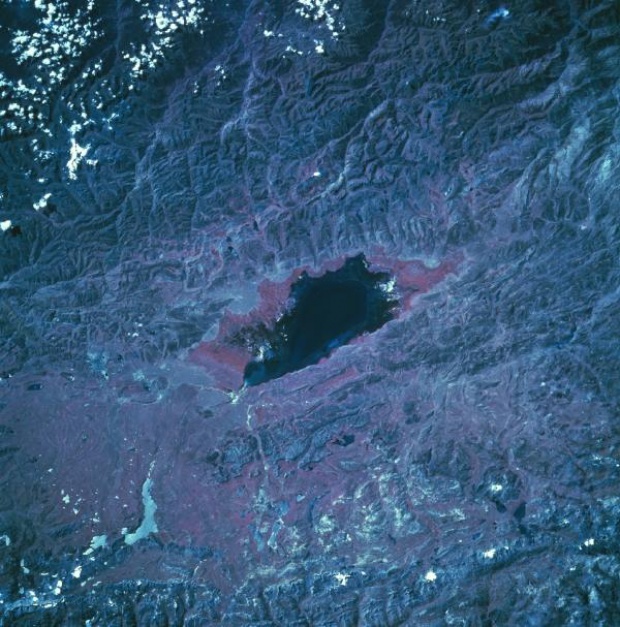 The dark feature in the center of the color infrared image is Lake Junin. Located at approximately 13393 feet (4082 meters) above sea level, Lake Junin is about 90 miles (145 kilometers) northeast of Lima in the Andes Mountains. 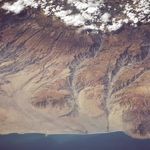 Numerous erosional stream channels and deep canyons are visible at the top (northeast) of the image. The rivers drain eastward and eventually flow into the Amazon Basin of eastern Peru. Notice that there is a redder border that encircles three-quarters of the lake (except the southwest coast). This is an indication that healthy green vegetation (green, chlorophyll-bearing vegetation is portrayed as reddish hues in color infrared images) can be mapped around most of the periphery of the lake. The lake measures roughly 25 miles (40 kilometers) in length and approximately 9 miles (15 kilometers) in width. Some of the mountainous terrain immediately southwest of the lake shows an intensively folded, northwest- aligned landscape..
Yauca and Acari River Canyons, Peru May 1996. 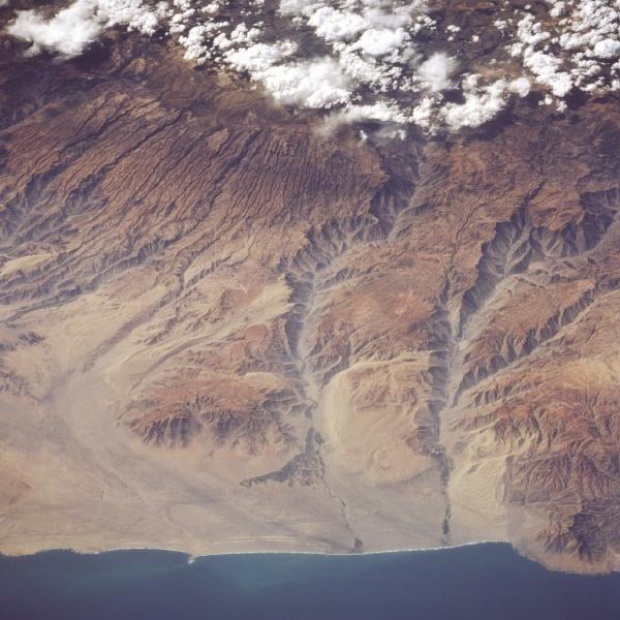 The dry, canyonlike terrain of the Peruvian coast is visible in this northeast-looking, low-oblique photograph. Clouds cover the western Andes Mountains, the longest mountain system in the world, which began to form 600 million years ago. Uplifted coastal plains deeply grooved the coastal areas, sculpturing deep canyons, some of which extend to the coast. A slow uplift continues to build the Andes, which are rising approximately 4 inches (10 centimeters) each century. Visible are many small canyons and two major ones—the Acari River Canyon (center of photograph) and the Yauca River Canyon to its south. Some irrigation is discernible in both river valleys and near the coast where the rivers empty into the Pacific Ocean. Point Chala appears at the bottom right of the photograph..
Ampato Volcano, Peru October 1988. The Andes Mountains region of South America is known as the Avenue of the Volcanoes. Thousands of volcanoes are scattered throughout the 4500-mile (7200-kilometer) length of the Andes from Panama to the southern tip of Chile (Tierra del Fuego). 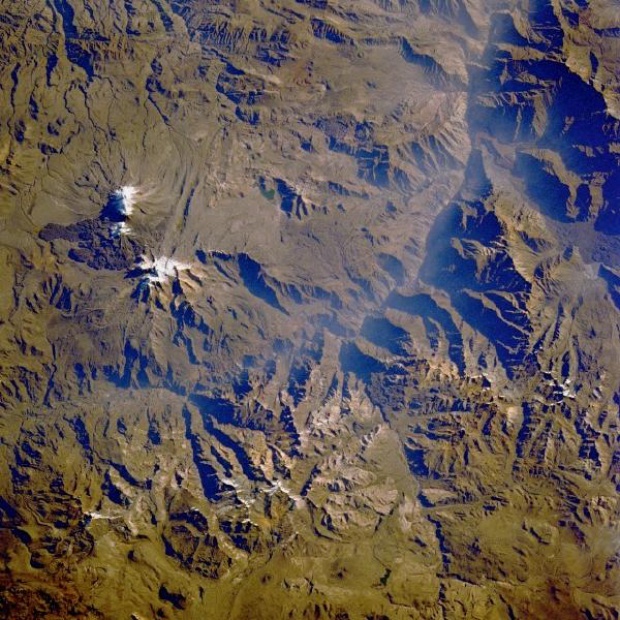 This photograph shows two major snowcapped volcanoes in the Arequipa Department of southern Peru. Southernmost Ampato Volcano rises more than 20 700 feet (6310 meters) above sea level. A vent developed on the northeast side of Ampato Volcano where a flank eruption occurred, as evidenced by the extensive, darker lava flow, which is almost always indicative of more recent flows. Many of the volcanoes exhibit the pronounced, classic, radial drainage pattern. The deeply shadowed canyon northwest of Ampato Volcano is part of the Colca River Valley, whose river eventually empties into the Pacific Ocean. Most of the rivers flowing through this part of Peru are short and flow intermittently. This mountainous region is part of the Western Cordillera where the climate is extremely arid, with most areas receiving less than 10 inches (25 centimeters) of precipitation annually; therefore, vegetation is sparse. The Peruvian coastal mountains are under the influence of a dry air mass that is stabilized by the cold Peru Current..
Coastal fog commonly drapes the Peruvian coast. 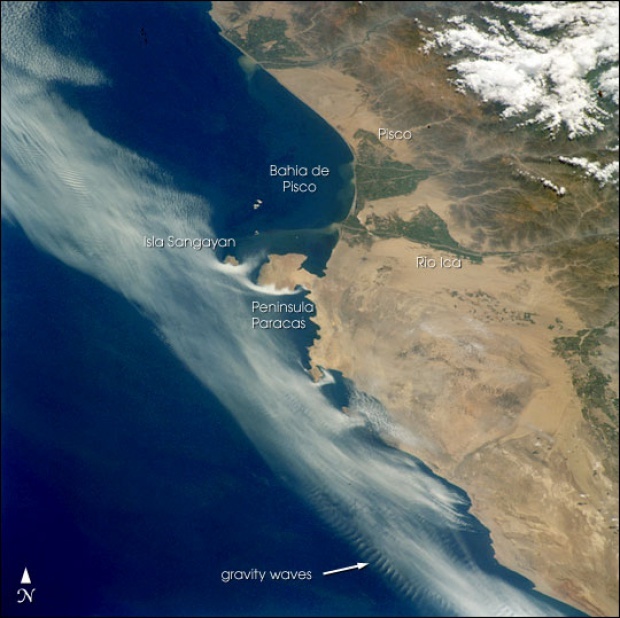 This image captures complex interactions between land, sea, and atmosphere along the southern Peruvian coast. When Shuttle astronauts took the image in February of 2002, the layers of coastal fog and stratus were being progressively scoured away by brisk south to southeast winds. Remnants of the cloud deck banked against the larger, obstructing headlands like Peninsula Paracas and Isla Sangayan, giving the prominent “white comma” effect. Southerlies also produced ripples of internal gravity waves in the clouds offshore where warm, dry air aloft interacts with a thinning layer of cool, moist air near the sea surface on the outer edge of the remaining cloud bank. South of Peninsula Baracas, the small headlands channeled the clouds into streaks—local horizontal vortices caused by the headlands provided enough lift to give points of origin of the clouds in some bays. 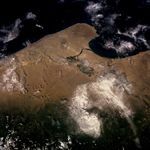 Besides the shelter of the peninsula, the Bahia de Pisco appears to be cloud-free due to a dry, offshore flow down the valley of the Rio Ica..
Coropuna and Soliman Volcanoes, Peru May 1997. 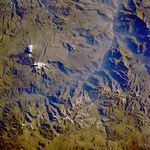 This image shows two magnificent, snow-covered stratovolcanoes located in the Andes Mountains of southern Peru. Just to the left of center lies the 21080 foot (6419 meters) Coropuna Volcano. To the west (above) sits Solimana with at an altitude of 20069 feet (6121 meters). Both have been dormant for the past 100,000 years. To the west (top center and top left of the image) is the deep canyon of the Colohuasi River, which merges with the Ocona River (upper left). 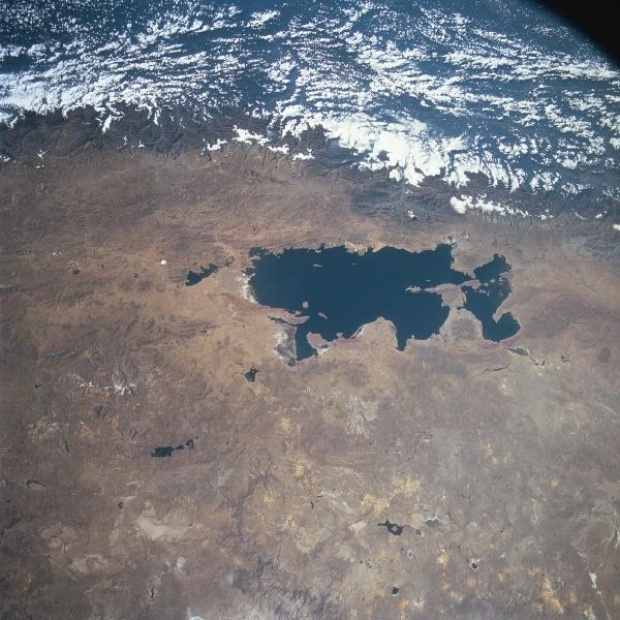 As the Andes have continued to rise, these rivers, which flow into the Pacific Ocean, have kept pace by eroding deep canyons and valleys..
Lake Titicaca, Peru and Bolivia June 1996. 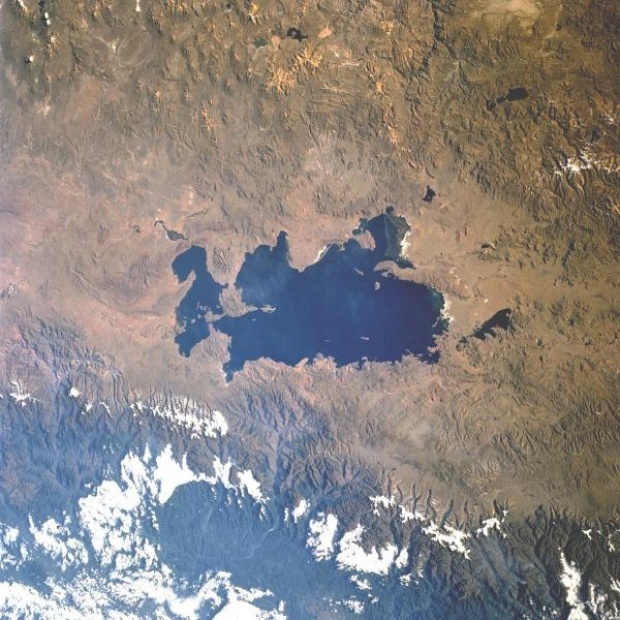 Located in the high plateau of the Andes Mountains at roughly 12500 feet (3700 meters) above sea level, between Peru and Bolivia is Lake Titicaca (large dark feature at center). The lake is divided by a north-south boundary that partitions the northwest section of the lake to Peru and the southeast section to Bolivia. Climatically, this section of the Altiplano is classified as semi-desert. Most of the precipitation that falls comes with the summer rains. This moisture, or recharge of freshwater into Lake Titicaca, is supplemented by melting snow and ice from the Andes Mountains. This image graphically shows the impact that the Andes Mountains has on the local climate (cloud covered eastern slopes of the Andes versus cloud free conditions on the Altiplano)..